I love being a Stampin' Up! Demonstrator. Not only do I get to craft with amazing products but I also get to attend Onstage, an event twice a year where we get to see & bring home some awesome new products. Stampin' Up! are very generous & give away prizes at these events in the form of stamp sets, embellishments, inks & even the New catalogue to take home. The best part about Onstage is everyone wins a prize! Today I am sharing a very cute new stamp set called Baby Bear. It will be very popular once the new 2016-2017 Annual Catalogue goes live on June 1st! I was having a play with some retiring products & figured a great way to welcome the NEW is to say goodbye to some great retiring products at the same time. I have made both a female & male version of this cute little bear, both using current & retiring products. This stamp is a 3 step stamp & requires a keen eye to line up. These ones are not perfectly lined up, but still look great. I have used Sahara Sand, Crumb Cake & Early Espresso as the 3 layers of inks on the girl bear below. I gave this bear a bit of extra dimension by cutting an extra head & raising it up on dimensionals. I have used the Itty Bitty Accents Punch pack & blushing Bride cotton ribbon (both retiring) for the bow & flower on the bear's ear. The good news is the frame for the sentiment & the flower, both from the Rose Garden thinlit dies, from the Occasions Catalogue. The DSP is Blushing Bride from the Subtles DSP paper stack. 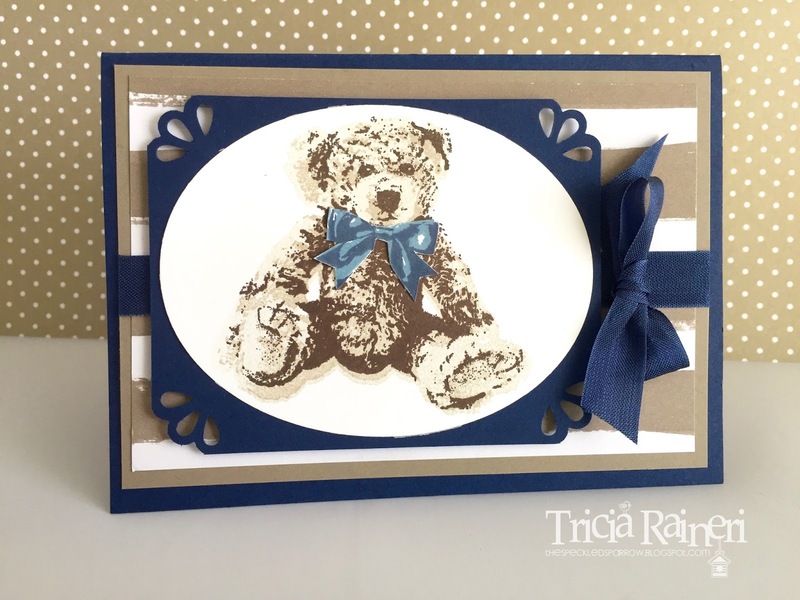 For the boy bear, I have used Sahara Sand, Crumb Cake & Chocolate Chip as the ink layers. I prefer the Chocolate chip for a softer fur feel. The boy bear needs less embellishment, just his cute little bow which is included in the stamp set. I stamped his bow in Marina Mist & Night Of Navy. I have used the Go Wild DSP stack for the background, Night Of Navy Seam Binding ribbon & the Curvy Corner Trio punch - ALL retiring! 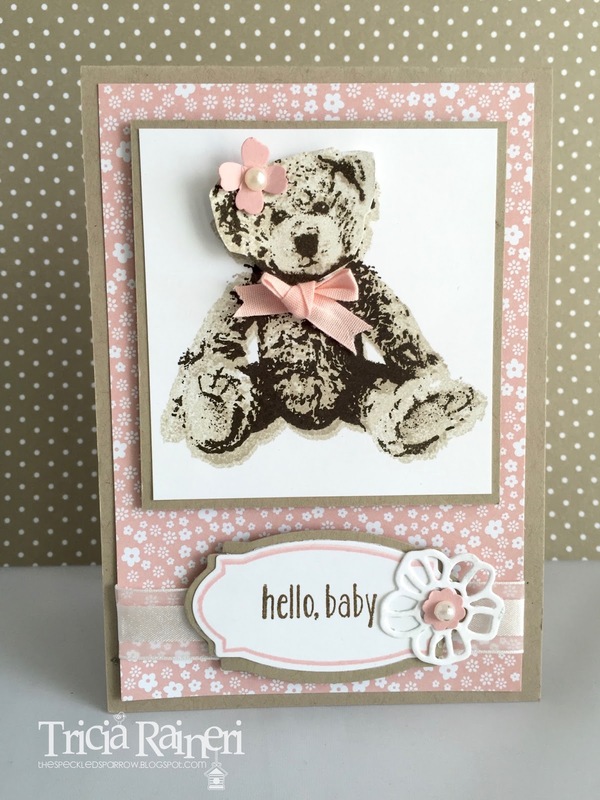 I can tell this little Baby Bear is going to be very very popular come June 1st. I have already fallen in love with his cuteness! I have provided the links to the retiring products I have mentioned in my shop list below. I urge you to buy what you love before it goes as these retiring products are selling out very fast, & with only a month to go, they won't last that long as they are all while stocks last!